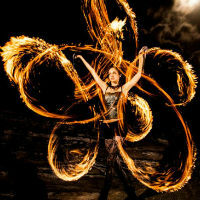 Hire a fire juggler, fire breather or fire poi artist to truly take your event to the next level. Great for a theatrical centre point or to entrance guests as they arrive at your venue. 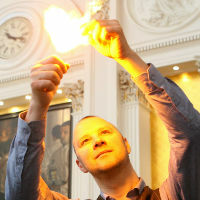 Our fire jugglers are based in Glasgow and Edinburgh but are happy to travel. Our fire acts are safe and family friendly and work at festivals, weddings and corporate events all year round. They can also perform with glow effects and glow poi if fire isn’t an option at your venue. 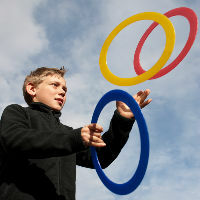 For something fun and visually arresting it is difficult to look past an expert juggler. 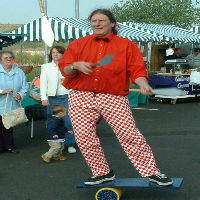 Able to banter with audiences and draw big crowds our jugglers are well versed in entertaining at festivals, parties, corporate events and weddings. Most of our jugglers combine skills and are very versatile, even putting on a brilliant floor show in clubs or venues upon request. So for a juggler in Glasgow, Edinburgh or across Scotland please get in touch. 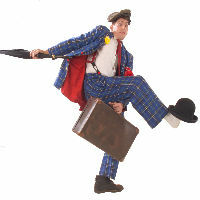 Circus City offer a range of stilt walker characters to enhance any theme you can dream up. From winter fairies to 50s be-bop, each of our performers can even come up with creative costumes and ideas to match whatever vibe you want to achieve. 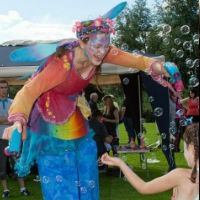 Visually arresting and fun for all the family our Glasgow and Edinburgh stilt walkers are also multi-skilled so just ask if you want bubbles and balloons adding to the entertainment. So you’re looking for something a bit different and off-the-wall for your event… something that will break the ice and get people talking long after the evening has ended. Our modern clowns and novelty acts are just the thing. With years of experience performing in the corporate sector they are able to engage and delight even the most serious CEO. We also offer a range of amazing classic clowns, balloon modellers and children’s entertainers if you are looking for something more traditional. You can be sure face painting will be one of the most popular forms of entertainment at your bash and all our face painters are creative, efficient and able to offer a superb range of designs. A face painter is one of the cheapest yet most dynamic ways to ensure your event gets a lot of people smiling all day long. For a face painter in Glasgow, Edinburgh and across Scotland call us now. 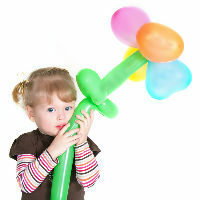 Circus City can provide balloon twisters and modellers for all events and this is one of the cheapest ways to keep large groups of children excited and entertained. Always one of the most popular and versatile of entertainers our Glasgow and Edinburgh balloon-shaping experts will be able to keep hundreds of kids and adults happy by making special animals, aliens or extravagant hats with nothing more than some rubber tubes and oodles of imagination. Shazam! A close-up, sleight of hand or table magician can keep hundreds of guests entertained in any environment from a wedding reception to a large corporate dinner. We also have many superb children’s magicians, trade show magicians and mind-reading magicians in Glasgow, Edinburgh and across Scotland. Our caricaturists will mix and mingle at your event or dinner while drawing fantastic portraits of your guests, but always with an amusing slant. We can ensure this will be one of the highlights of your event because your guests will be left with a beautiful memento too! 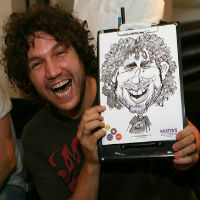 A caricaturists is perfect for weddings, office parties, trade shows or corporate dinners. Hire a caricaturist in Glasgow, Edinburgh and across Scotland now. 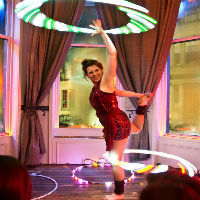 For an awesome Hula Hoop act in Glasgow, Edinburgh and across Scotland look no further. With both traditional hula hoop and glow hula hoop our specialist performers can wow any audience in any kind of venue – from a house party to a large corporate stage. A range of music, styles and themes can be selected, from elegant through to high-energy rock to get any party started. Circus City offers a fantastic circus workshop which will keep children of all ages engrossed and delighted from beginning to end. The children get to practice skills such as plate-spinning, juggling and diablo manipulation from a professional who knows how to engage and entertain. Great for scouts, guides, schools and birthday parties our workshops are fun and educational. Circus workshops are also a fantastic option for corporate team building exercises or something a bit different at the next office party! For a circus workshop for schools in Glasgow, Edinburgh and across Scotland please contact us now.